iClone 4 is a real-time 3D animation software that provides several tools for filmmaking and video production including motion graphics, 3D animation and video compositing. The 3D filmmaking production environment lets you drag and drop for quick editing, edit objects in-screen, and build an animation timeline. The video compositing side of the software includes several useful features including placing videos on a 3D object and incorporating live actors in the virtual environment. Before utilizing the advanced features of this software, become familiar with the interface and basic actions. Familiarize yourself with iClone's interface. 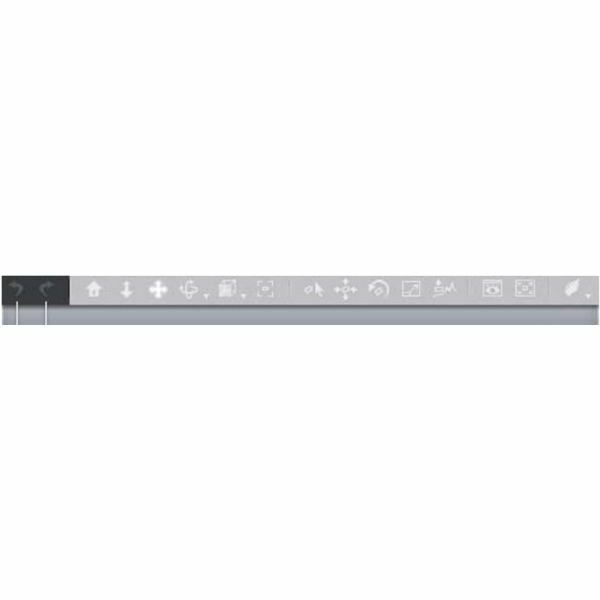 Navigation Pane – To enter a specific interface mode, select one of the tabs in the navigation pane. There are seven tabs including Project, Stage, Set, Actor, Head, Animation, and Export. 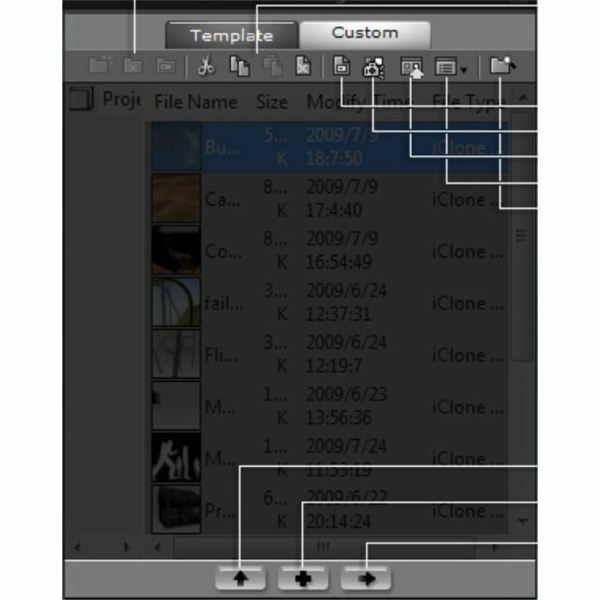 Tools Menu – To access different editing modes quickly, use the Tools Menu. It is a drop down list featuring the sub-items of each navigation tab. For example, under the Project tab, options include New Project, Open Project, and Save Project. 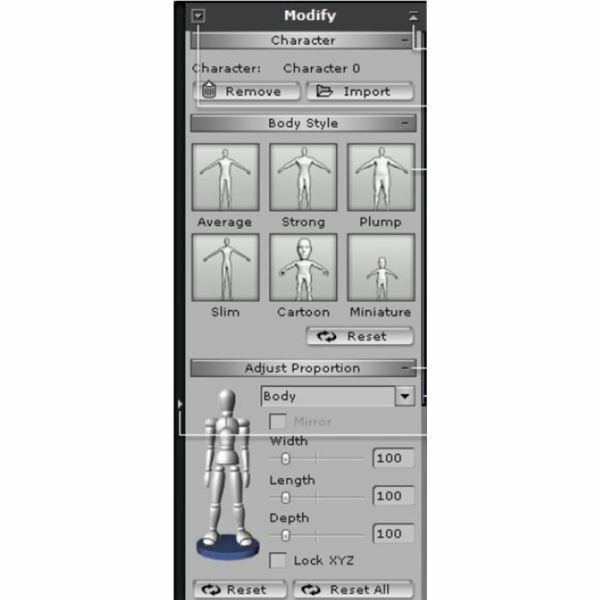 Content Manager and Scene Manager – The Content Manager window contains iClone 3D files that are available for a project. Here you can cut, delete, or add files, as well as apply files for the current project. The Scene Manager window contains the content that is currently used for a project. Here you can decide which objects are visible in the 3D viewer, and you can change the render state of an object. 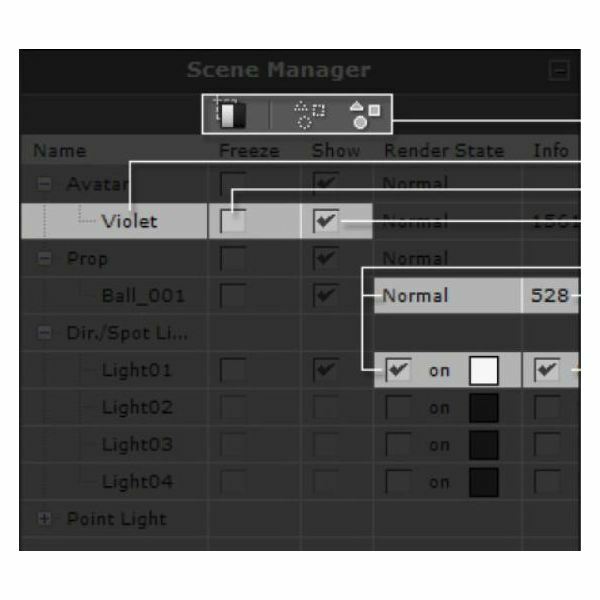 Control Bar – Use the tools in the Control Bar, located on top of the 3D viewer, to adjust the camera, undo changes, manipulate objects, and preview an image. Some of the buttons here include Undo, Redo, Home, Zoom, Pan, Move Object, Rotate Object, and Full Screen. 3D Real Time Viewer – This displays your project as it will appear. To access the 3D Real Time Viewer window, click the Preview button in the Control Bar. In the 3D viewer, you can change the camera view and adjust the shading. 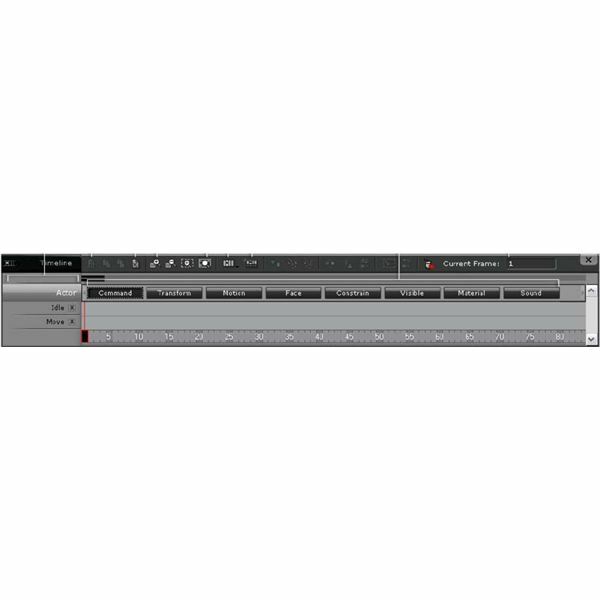 Play Bar – Use the tools in the Play Bar to control the playback of scenes. Watch the entire project with the Play button, or drag the Play Head to view a specific segment. Quickly change between Editor Mode and Director Mode or adjust the volume. 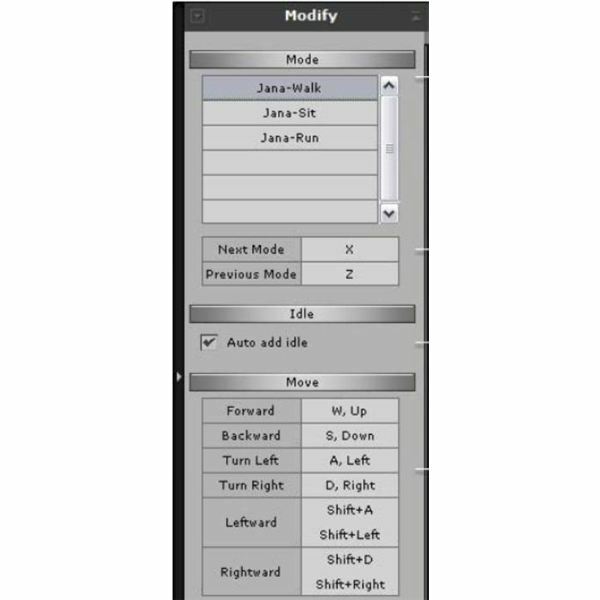 Modify Page – Located on the right side of the screen, the Modify Panel is used to adjust the various parameters of an object. It has different options depending on whether the 3D viewer is in Editor Mode or Director Mode. 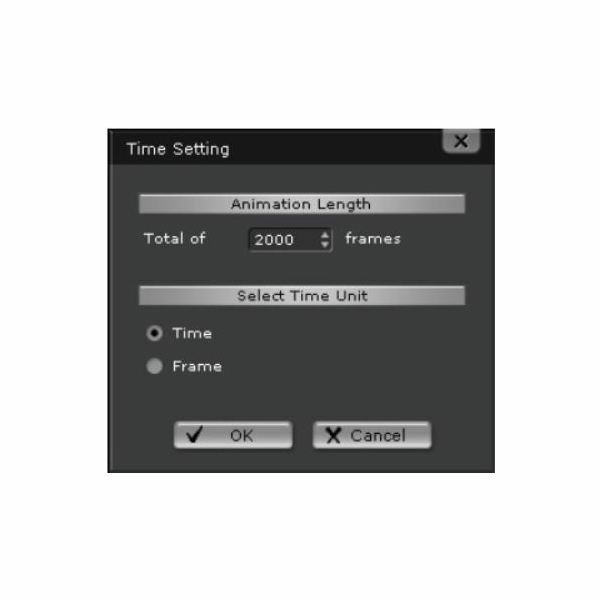 Time Settings Panel – Set the duration of a project in the Time Settings Panel, which is accessible from the Play Bar. Click the clock icon to the right of the current time counter to access the panel. 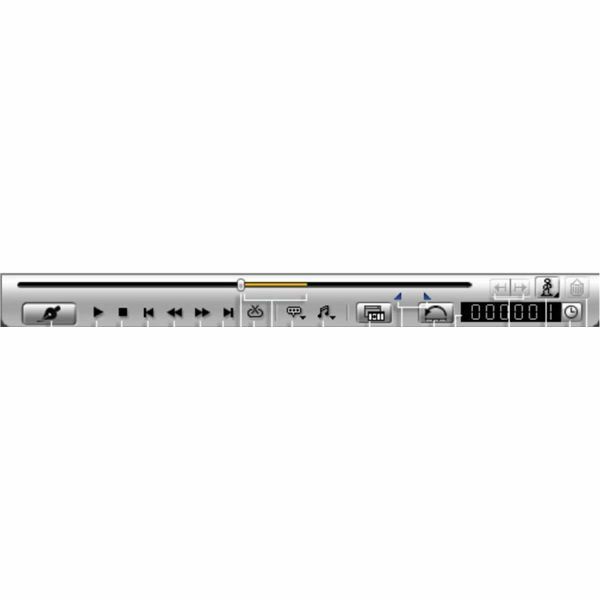 Timeline Editor – Click the Timeline button on the Play Bar to access the Timeline Editor. Here you can increase and decrease the speed of a clip, break a clip into separate segments, and hide specific tracks. Select Actor from the Navigation Pane. Go to the Modify Page and find the Adjust Proportion section. From the drop down list, select the body part to modify. You can also click the body part on the avatar (fingers are only accessible from drop down list). Adjust the width, length, and depth of the body part. To apply the same changes to similar limbs (arms, legs), check the Mirror box. Select the Gloves, Shoes, or Accessories button under the Actor tab in the Navigation Pane. Choose the styles you like and view how they look on the actor. If the accessories are too large, trim it with the CloneCloth tool. Double click on the actor and go to the Modify Page. In the Look At section, select Pick Target. Switch to the 3D Viewer and select a target for the actor to look at. You can select the whole target, or a specific node of the object. Click the Head tab in the Navigation Pane and select Load Image. Find the photo you want to use and click Open. Use the crop tool to frame the face. The arrow should point towards the top of the head. Drag the corners of the rectangle to rotate the image. The face should be adjusted relative to the rectangle. After the face is aligned, click the check mark. Then click Next. The next step is to adjust the facial boundaries. In the 3D preview window, set the gender of the actor with the drop down list. Then, drag the facial boundary points so that the outline of the face is traced. Click Next. If the face isn't oriented forward, correct it with the Roll X-Z tool in the following window. Once this is complete, click Next. The final step is to adjust the features of the face including the eyes, nose, mouth, and eyebrows. The goal is to match the photo exactly. Click OK after this is complete. A dialogue box will pop up to confirm the facial model. Click OK. The newly created head will be stored in the Custom folder under the Head tab.